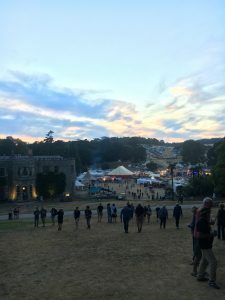 We went to the Port Eliot Festival recently and had a great time watching a mix of bands, discussions and presentations by a wide range of writers and performers. They definitely showed how to deliver a winning presentation in a muddy field and I’d like to share some of my reflections with you so you can take some learning from what I saw and apply them to your own presentations. The content was excellent as you’d expect and was really varied across the festival. Some of it was designed purely to entertain, some to be thought-provoking and some was designed to make you want to change the world, or at least the way you thought about it. Watching the presentations reminded me of the absolute importance of defining your outcome before you start. 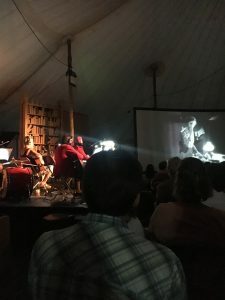 Lots of presenters used visual aids, from the classic PowerPoint photos with differing levels of effectiveness to Wurlitza who showed a full 1928 silent film called “A Cottage on Dartmoor” and, as a band, played contemporary songs and music to superbly enhance the experience. The best use of visual aids to my mind was Peter Asher, half of Peter and Gordon who had a string of hits in the 1960s. He used a mix of photos to illustrate his story of his life in Rock and Roll and then played along with his ex musical partner (who has died) by having a video of him playing the song and then playing and singing with him. It was incredibly good and incredibly moving. This also illustrated the need for preparation- especially with the IT and other technical aspects. An example of how not to do it was seen at one of the tents on the first day where the technicians had set the back projection up so the images were back to front. It took them ages to sort it out, meanwhile, the audience were getting bored and some people left. Following this bad start, it appeared that the remote control the presenter was using didn’t work so she had to get the technician to sit under the screen with the laptop and change the images at the presenters request. This affected her state and she appeared to be nervous and lacking confidence throughout her presentation. Lots of the presentations we saw were obviously well rehearsed. My favourite example was Ben Moor and Joanna Neary who appeared as two estranged authors talking about their books. The timing, humour, structure and presentation showed their experience as actors but also the importance of rehearsal. Rehearsal and structure doesn’t mean rigidity though. 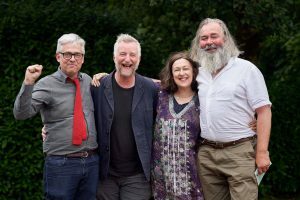 We watched a well structured and prepared discussion which was being recorded for a Backlisted Podcast with a group of people discussing George Orwell’s The Lion and The Unicorn. The main presenter was Billy Bragg who was very passionate about the topic and who, at the end of the discussion got everyone to stand and sing “Jerusalem”. We were lucky enough to chat to Billy over lunch where he told us that was not part of the presentation and it just felt like the right thing to do at the time – it was. So, take a risk, listen to your inner voice and if it feels right to try something unplanned, it usually is. We saw various performers utilise the environment they were presenting in a number of ways. The most spectacular were Hat Fitz and Cara who played a highly energetic and intense set in a small bar and had the whole audience bouncing and singing throughout. The following night, they played much of the same set in the Church, with a choir. Their set had a very different and euphoric feel as they utilised the environment perfectly and it was interesting to see how they changed their performance to match the environment. Everyone was still dancing and singing, it just had a different feel and everyone left smiling. So think about the environment you are going to be presenting in and adapt your presentation to the space. Remember though, whatever the environment, be enthusiastic. Almost everyone we saw was enthusiastic and passionate. Passion is a much-overused word. Watching Masterchef the Professionals everyone said they were ‘passionate’ about food. To me, it’s one of those words that if you use it to describe yourself, you’re not. Like ‘crazy, ‘wacky’ or ‘fashionable’. Which Shappi Khorsandi did extremely well. She was well structured and well rehearsed and so enthusiastic and confident about her topics that she was able to ad lib, interact with the audience and react to what happened around her to enhance her performance- and our enjoyment. There were only two presentations I saw that I didn’t enjoy. That wasn’t because of the content, but the way they were delivered. One presenter took more than ten minutes to get to the topic of his presentation- we don’t know what the main content was because we left. The other was presenting a topic I was interested in but he presented as if he was lecturing to a group of students, was loud and hectoring, used bland videos in an uncreative way and didn’t engage with the audience. I’m sure we missed a lot of really great presentations but there was so much going on that even spending 14 hours a day over the festival we could only get to a small percentage of what was on offer. So the message for me was that focusing on some key areas for you presentation is going to help you get the outcome you want, regardless of whether that is a presentation to colleagues, potential clients or a large audience at a festival.